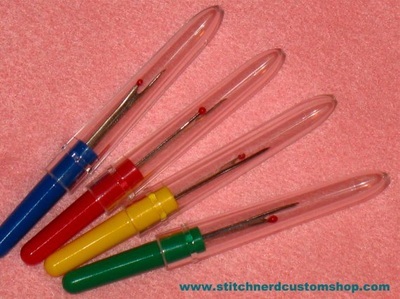 Seam Ripper in your choice of primary colors of Red, Blue, Yellow, or Green. Next to your sewing machine, this is the 2nd most important tool to have in your sewing room. Use seam ripper to cut and remove unwanted stitches. You can also use this little tool to open buttonholes - insert point between stitches, insert pin at end of buttonhole to prevent cutting through end stitches, slide blade to cut fabric. 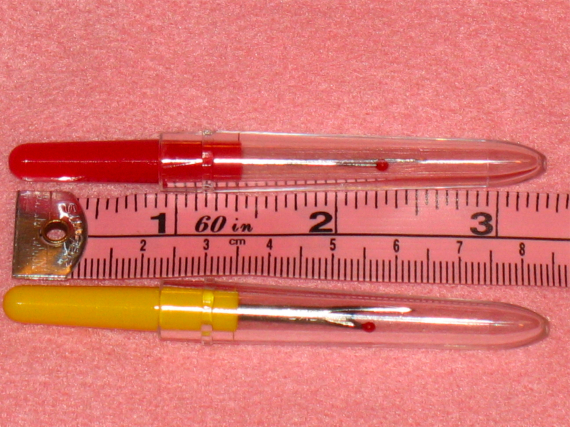 The seam ripper measures approximately 3 1/2 inches (8.5 cm) long (with the handle on). Has a very fine blade which slips under the shortest stitches. This listing is for 1 (one) Seam Ripper. SKC Brand made in Japan. Please specify the color you would like in the note to seller box at checkout.